This paper uses regional structural indicators and firm-level data of the EIB Investment Survey to show that framework conditions and firm innovation inputs affect innovation performance and regional productivity growth. 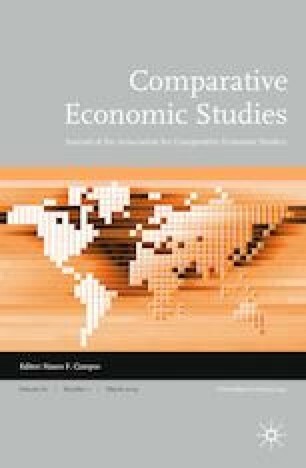 We argue that, in addition to more R&D investments and access to higher levels of human capital, improvements in the regional business environment—including the quality of institutions and infrastructure—can help firms close the gap with the technological frontier and support the economic development of European regions. The views expressed in this paper are those of the authors and do not reflect the views of the European Investment Bank. The authors thank the anonymous referees for their helpful comments and feedback. where gr is the average rate of growth of gross fixed capital formation in region r in a 5-year period. Instead of using an automatic rule, the depreciation rate δ and the years of computation of the average for gr have been chosen for each of the 28 EU countries (using granular grid search) in order to obtain a measure of the evolution of the capital stock that is similar to the national one (available in the AMECO dataset). We then applied the two chosen parameters to each region in that country. The analysis in Table 2 uses a panel with 2 years of data (T = 2), the two first waves of EIBIS. The number of available observations is 9480 (each wave of the EIBIS survey includes around 12,300 firms) with a small share of firms observed in both periods. The unit of observation of the dependent variable (introduction of new products, processes or services) and many explanatory variables is the firm; only the explanatory variables related to the quality of institutions and of infrastructures and to the available skills in the labour market vary at the regional level. Table 2 shows the results of a random-effects panel probit regression analysis. In order to test for endogeneity in the model with innovation activity as dependent variable, we run four separate two-stage least squares estimations on a balanced panel of firms that are observed in both waves of EIBIS. As a result, the number of observations using this balanced drops to 774 from 9480. The endogeneity tests are then carried out using the first lag of the four different types of intangible investments as instrumental variables. The null hypothesis for exogeneity cannot be rejected for R&D including IPRs, for software, data, IT networks; and for organisation and business process improvements. However, exogeneity is rejected for training of employees. Diagnostics tests for multicollinearity (pairwise correlations and variance inflation factor) suggest that mulitcollinearity is not a serious issue for the explanatory variables that we consider (Tables 5 and 6). Educational attainment of working age pop. Intan. inv: organ. and business process impr. The analysis in Table 3 uses a panel with 16 years of data (T = 16), based on the matched EIBIS-Orbis database. The unit of observation of the dependent variable (patenting activity) is the firm, while many explanatory variables vary at the regional level, with the exception of categorical variables used as controls for size, sector and country group of each firm. Diagnostics tests for multicollinearity (pairwise correlations and variance inflation factor) suggest that mulitcollinearity is not a serious issue for the explanatory variables that we consider (Tables 7 and 8). The estimation in the first column of Table 4 is based on a panel regression with fixed effects. The unit of observation is a region, and all explanatory variables vary at the regional level. The Hausman test confirms that the choice of fixed effects is adequate in this setting. Inference is based on robust standard error to address heteroscedasticity. Following Männasoo et al. (2018), we also use dynamic panel estimation (based on the Arellano–Bond estimator) and find that the results are qualitatively similar to those in the first column of Table 4 (Table 9). Despite the inclusion of lagged TFP growth in the list of explanatory variables, the estimates have the same signs and similar magnitude. Dynamic panel estimation (based on the Arellano–Bond estimator). TFP gap, growth in R&D expenditures, change in share of employment in knowledge-intensive sectors (KIS) and regional TFP growth. Interaction TFP gap and R&D exp. In the other columns of Table 4, we use random effect estimation because we include the time-invariant variables proxying for framework conditions. We include these variables one at the time in order to avoid potential multicollinearity issues.